To add insult to injury, it’s exceedingly difficult to arrive at a decision as to whether the tumor you’ve just removed has been cured by your surgery…or whether it’s just going to come back bigger and badder than ever (usually in the same location but sometimes in a local lymph node or internal organ). Apart from surgically removing a wide swath of skin, fat, muscle (and sometimes bone!) from around the mass (at least one centimeter in all directions but for higher grades, as much as three centimeters), treatment can also include radiation therapy or chemotherapy. Radiation is especially helpful should the tumor be diagnosed as a high grade malignancy (mast cell tumors are graded on a scale of I-III, III being the worst)…or should it appear in an area where a complete surgical excision is impossible (as on the face or a lower limb). Chemotherapy is indicated for some high grade tumors (Grade III), some incompletely resectable tumors or when metastatic disease (spreading to local lymph nodes, for example) is present. The trials and tribulations of mast cell cancer is frustrating for veterinarians and confusing for pet owners. That’s especially true when your oncologist disagrees with your general practitioner who also disagrees with your internist. Yes, even among specialists mast cell cancer is hotly debated and subject to many internal disagreements––particularly with respect to the right way to treat them. The various grades of mast cell tumors and the many modalities we can apply to treat them makes for a perfect storm of confusion. 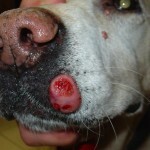 Add that to the tumor’s ubiquity (it’s the second most common tumor type in dogs), and you can begin to understand why mast cell tumors give veterinarians headaches and sleepless nights. Take, for example, one of my recent MCT patients. She was diagnosed with a Grade II, but margins were “dirty” (not completely free of tumor). One oncologist wanted to irradiate immediately. Another general practitioner suggested injecting the area with prednisolone (a steroid) and a surgeon wanted me simply to go back and get clean margins. A radiation oncologist at the University of Florida finally ratified the surgeon’s opinion, discrediting the injections and stating that radiation was unnecessary for a surgically resectable Grade II. So you know, I ultimately went with the latter, well-informed approach. But what a mission! That’s why the news of a new cancer therapy specifically for mast cell cancer is both exciting and stressful. Hooray for my more severely affected patients with recurrent disease! But what’s that going to mean for my recommendations? It’s no stretch to say that I’m a tad confused––as seems to be the case with some of my colleagues on VIN (the Veterinary Information Network), too. So I did some research. This drug is called Palladia. Manufactured and marketed by Pfizer, the drug (oral) is in a class of drugs called tyrosine kinase inhibitors. They work by blocking the activity of receptors important for the development of blood vessels supplying the tumors, as well as for receptors critical to tumor survival. 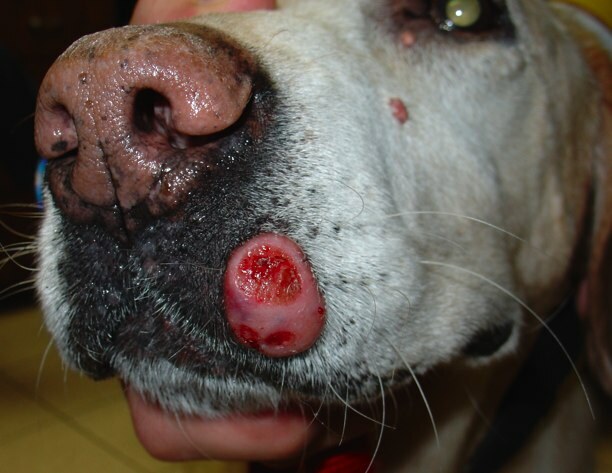 Its stated use is for canine mast cell tumors that recur after surgical excision, with or without local lymph node involvement. It shrinks these tumors and extends the comfortable life of these patients. Side effects? I don’t have the percentages, but many dogs apparently experience gastrointestinal symptoms like vomiting, diarrhea and inappetance. Lameness, too. They appear to be reversible. Death is possible, however––though very rarely with careful attention to side effects. The other side effect worth considering is the price. A similar drug marketed by Pfizer for humans, Sutent, goes for $5,000 (for 28 pills!). Who knows what Palladia will cost, but it’s safe to assume it won’t be that expensive. Nonetheless, I bet its price will best radiation’s priciness but come in well over what standard surgical techniques would cost. For now, Palladia will only be in the hands of oncologists and internists (as Pfizer decides how it’s going to market the drug and accumulates more data through this select group of professionals). But the common nature of this tumor likely means that Palladia will be coming to a veterinary hospital near you. I guess then it’ll come time to implement the new drug. As it stands, I’m not so sure its benefits outweigh the risk of its side effects when you consider that another surgical resection might be just as curative (if there’s no evidence of metastasis)––statistically speaking, anyway. It’s about time veterinary medicine had a drug FDA-approved for use against cancer. This is where oncology is headed––away from invasive surgery, stressful radiation and indiscriminate chemotherapy…and more towards vaccines (like the melanoma vax), gene therapy––and, of course, drugs like this one. So here i have 4 dogs, the mother & her 3 children. All with Mast cell cancers. I have been anxiously awaiting the release of Palladia. Though now the cost is prohibitive. I have tried natural herbs. They eat better than me. I feel so at wits end. Here I know Palladia would cure this cancer in all 4 of them. Yet with now facing first the surgery to remove more of them. That will cost easily a thousand. I should be the poster girl for “life gone to the dogs” yet these dogs are the love of my life! So are there any programs to help for one woman with 4 gorgeous curable dogs? Hemangioacoma and Mast cell is the type of cancer my babies got. It is of the recurring nature that makes it wonderful there is Palladia. I have to have more of the flare ups removed. Which is surgery. And very expensive. The emotional factor of all these dogs have never been away from me since they were born, soon to be 10 years old. What a blessing there is a cure though when it’s not affordable it is very painful for me. The person that having devoted my money, time, and all my love into these animals. The mother dog was barely a year old when I rescued her from people throwing rocks at her. Little did I know she was carrying 11 puppies. So the long road began for me. 10’s of thousands of dollars later. I’m deeply in love & in debt as a result. I am struggling financially to keep my dogs alive. I have had them since they were born. Money should not dictate whether our loved one’s can live or or die. My dogs have cancer which Palladia is a blessing. Cost is prohibitive. 5,000 per dog & I have 4 dogs. Is this to say only the rich doggies can live & our poor friends suffer. What is wrong with this picture. I have spent all my savings, decades of my life helping animals. Now I need help! I rescued one dog & she had 11 puppies. The mother dog I still have & 3 of her children. All have cancer that would need asap Palladia. I am at wits end. I love them & will spend my last penny to help them. I don’t know your situation exactly — the type of cancer, how advanced, etc — but have you tried any of the holistic options? Even tried herbal immune boosters?